Can we seize his assets now for the wall? 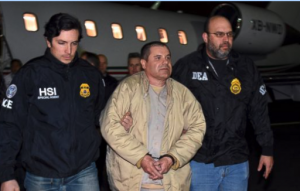 Notorious Mexican drug kingpin Joaquin “El Chapo” Guzman has been found guilty on all charges by a jury in Brooklyn federal court. Guzman’s federal drug conspiracy trial started three months ago. The verdict comes on the sixth day of jury deliberations.